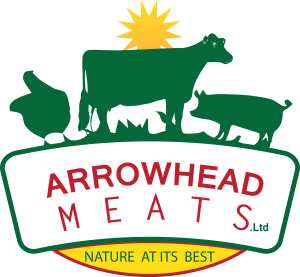 We at Arrowhead Meats, believe in good food, healthy lifestyles, and most importantly, a healthy relationship with our customers! We offer whole or half animals, but also family-sized boxes which are vacuum packed for freshness. Our site is a fully functional Ecommerce shop, so that you just have to order and have it shipped right to your door, the most painless shopping you’ll ever do. Our natural beef is raised in a slow paced, stress free environment. Our animals have their young naturally in the spring. This time of year provides a new clean environment for the calves to be born, out in the spring sunshine, on the new growing grass the way nature intended. They roam in their herd grazing in the sunshine on our extensive acreage. The result is a smaller animal of better quality, fed non GMO feed, as well as being drug and hormone free! Our naturally raised pigs are happy and free, and because they get to grow, root, and wallow outside with acres and acres of wide open spaces of lush clover, dotted with fruit trees, complete with a little stream, to roam in, they are very healthy and hearty. It is because our pigs are allowed to run free that they grow slower than the commercial factory farmed pigs. This slower rate of growth is what gives our pork it’s exceptional table qualities and succulent rich, well marbled meat with a full flavour. Pastured chicken are one of the highlights of the table! You can grill it roast it and have it on your salad, try it every where, it just fits!! In a casserole, on your toast. With cheese melted and dripping, or plainly marinated and lightly seasoned! Can you tell we love our pastured chicken?